If you have any questions about this product by trofie, contact us by completing and submitting the form below. If you are looking for a specif part number, please include it with your message. 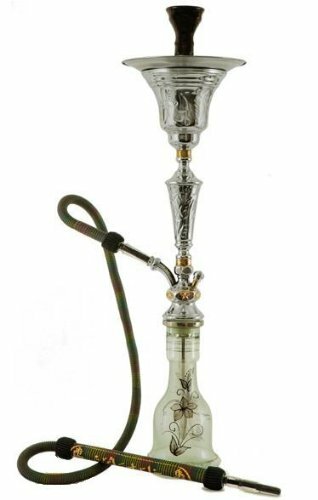 KHALIL MAMOON PHARONIE OXIDIZED 33” COMPLETE HOOKAH SET: Single Hose shisha pipe. Handmade Egyptian Narguile Pipes. These are Traditional Heavy Tri-Metal Hookahs. KHALIL MAMOON INDIAN OXIDIZED 32” COMPLETE HOOKAH SET: Single Hose shisha pipe. Handmade Egyptian Narguile Pipes. These are Traditional Heavy Tri-Metal Hookahs. KHALIL MAMOON BASHA TWO HOSE 34” COMPLETE HOOKAH SET: Multi Hose shisha pipe with 2 Hose and single hose capability. These hookahs are Heavy Tri-Metal Traditional Handmade Egyptian Narguile Pipes.